Looking for a San Diego pet sitter or dog walker? The loving staff at BeLoved Pet Sitting offers in-home dog sitting, cat sitting & exotic animal pet care. When you leave for a vacation or work extended hours, your pet can be left home to enjoy the safety and comfort of their own surroundings. Our pet sitter staff makes 30-60 minute drop-in visits to your home, to follow your pet’s regular feeding, walking & potty schedule. Whether you have cats, dogs, rabbits, fish, birds or any other fuzzy, or scaly creature, we’re happy to feed, clean up after and snuggle them. Check below for our San Diego Pet Sitter service areas. During our 7:00am-9:30pm office hours, clients can expect emails or phone calls to be returned or answered almost immediately. Our two week job training and in depth employee handbook ensures that you will get the same level of detailed care no matter which pet sitter you choose! If you are curious about what we accomplished during our visit, check your email or texts because we send a photo and notes! Feel at peace knowing your sitter arrived with our GPS tracked visits. Every dog walk is tracked so you can follow our route and see all the bushes we sniffed. 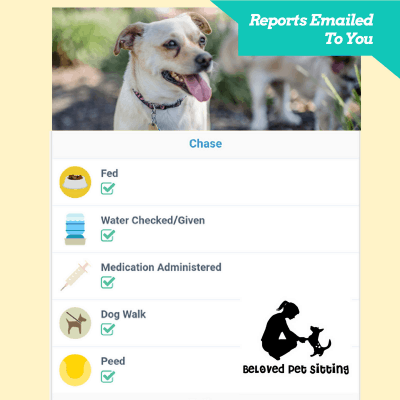 Eliminate the hassle of playing phone tag with us, request services online 24/7 in your pet portal account. Life is busy, we take automatic online payment at the start of your vacation or dog walk week. It’s on autopilot! So forget about it, enjoy yourself. We employ 4 pets sitters with wide availability, so we are open 365 days a year, 7:00am until 9:30pm everyday. All of our pet sitters have taken a Pet CPR and First Aid course. 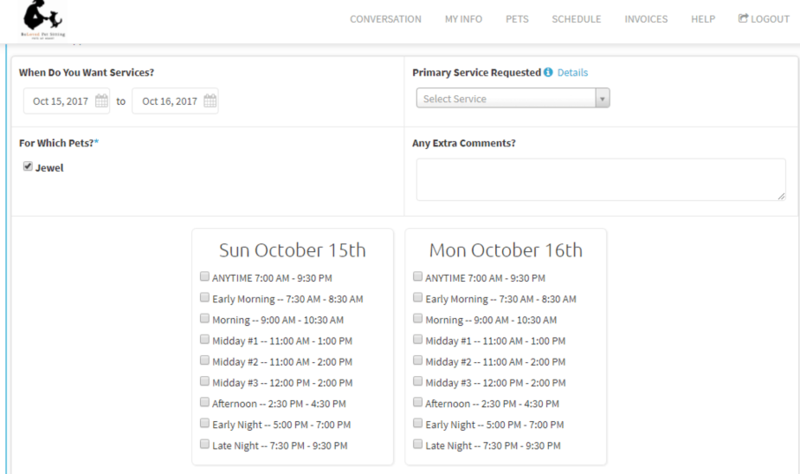 With BeLoved Pet Sitting, registering with our company and scheduling your reservations is easy! As a new client, you enter all of your information into our secured and encrypted pet portal system. Your pet portal account allows us to keep track of your contact information and your pet details. The pet portal is also where you go to make reservations and make payments. After you get your work schedule for the upcoming week, reserving your pet sitting services takes only minutes. You will receive a confirmation of service dates, times and an invoice via email when we approve your request. So when you need that San Diego pet sitter to cover for you, we’re here and ready! 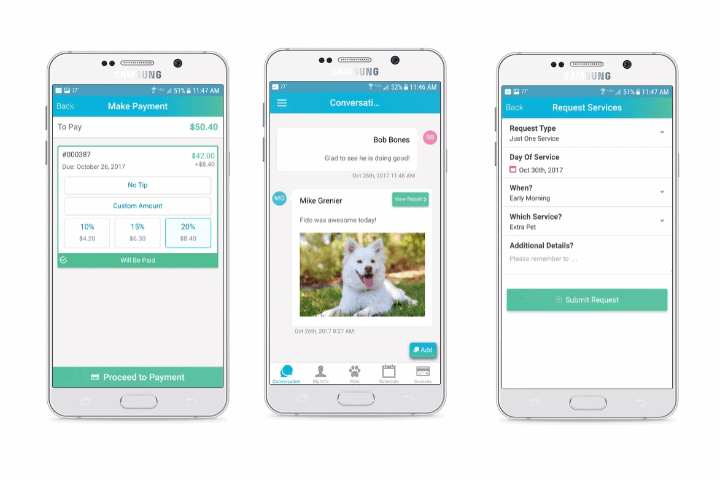 The Time To Pet App makes it simple and easy for you to request new services, check scheduled visits, update pet info, view and send messages to our staff. It’s also where you can go to make payments. The Time To Pet App can be downloaded directly from the Apple App Store or from the Google Play Store. At BeLoved Pet Sitting we believe pets deserve the best care in every way, everyday. View open positions under "About".